In an ever changing world of technology it’s no secret just how fast you can and will get your information. Depending on your level of interest, the answers to your inquiries are just a type, click and search away. The constant evolution of social media has been and continues to progress each passing year. So it’s no wonder the abilities that Facebook, Twitter, Instagram, LinkedIn, YouTube and Snapchat provide are simply amazing. In fact, Social media is so effective, that instead of turning on the morning news via the television or even getting a news paper, more and more you’re probably picking up your phone or tablet first thing in the morning over coffee and clicking on Facebook for the news. If you have a thought or picture you’d like to share you can also send via Twitter and Instagram. Got a quick video that you want to show people? Snapchat does the job and can also merge a series of video and still frames into one Story as they call it. No matter what the interest, social media provides it. And it’s here to stay. Whether you’re someone who has jumped in with both feet… er hands OR you’re someone who for sake of principle chooses not to engage. You’re well aware of it’s existence and have probably used one or all to some extent. So this why Green House Mortgage is staying on the trend. 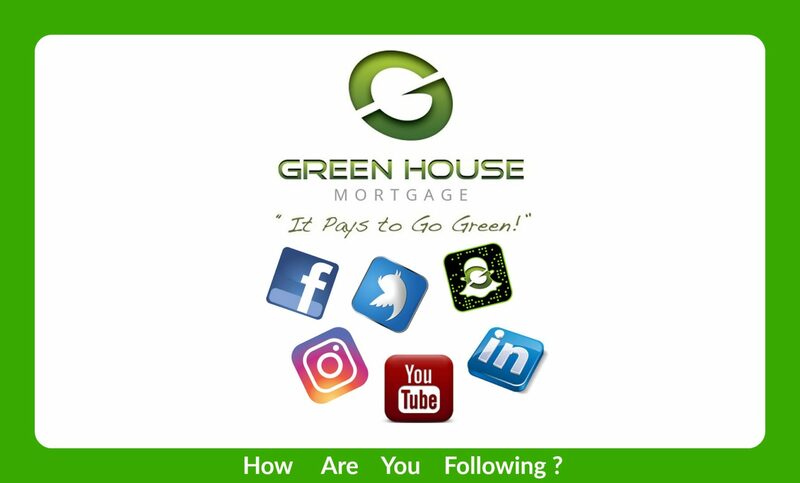 To make sure you have the very latest mortgage new, updates and statuses and trends for anything mortgage and real estate connected. Want to know how the market is affecting interest rates? Care to take a look inside a real live closing on a home purchase? Ever wonder if now was a better time to buy rather than later? How do you know if you can even get approved to purchase a home? These are all some of the questions you may have and can quickly get answers to. If you’re not following our social media outlets of choice, then maybe now is a great time to start. Get in the know and don’t get left behind. There is no better time than now. But if you have questions you’d better hurry. Because in the social media realm information travels fast! So, feel free to jump in with both feet (or hands) and engage.